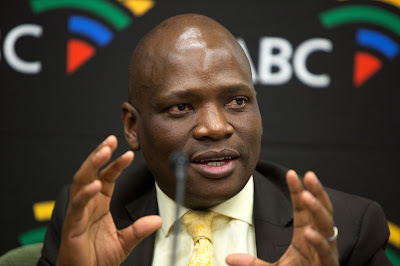 TV with Thinus: SABC boss Hlaudi Motsoeneng wants SABC staff to wear uniforms so that they can understand unity; says staff will be fired 'who run to the newspapers'. SABC boss Hlaudi Motsoeneng wants SABC staff to wear uniforms so that they can understand unity; says staff will be fired 'who run to the newspapers'. The SABC's controversial boss Hlaudi Motsoeneng is now considering ordering all SABC staff to wear uniforms. The latest idea from the SABC's controversial chief operating officer (COO) is for all SABC staff to wear uniforms so that they can understand unity, City Press reports. Hlaudi Motsoeneng spoke on Tuesday evening at a discussion hosted by the National Press Club in Pretoria. The discussion comes after his latest censorship decree, banning visuals of property destruction during public protests being shown on the SABC's TV channels. Hlaudi Motsoeneng was part of a panel that included veteran journalist and Press Council director Joe Thloloe, the SABC's commercial adviser Anton Heunis, and Alet Pretorius, Beeld newspaper's photo editor. "I have been thinking maybe our employees should have uniforms so that they can understand unity. The SABC is independent as an organisation, but no one is independent within the organisation." Hlaudi Motsoeneng said the SABC's latest censorship decision is popular with the masses. "I can tell you that 90% of South Africans are very excited with the transformation at the SABC and our improved news coverage, and I don't know where this other 10% comes from or who they represent. People are very apologetic where they have to implement equity and transformation, but not us at the SABC". Hlaudi Motsoeneng threatened that SABC staff who speak out about the public broadcaster will be fired. "We will get rid of those who run to the newspapers. Actually, SABC employees are very happy but there are a few rotten potatoes; there are very few of them, including those who leak internal information to the media". Joe Thloloe slammed the SABC's censorship decision, saying its exactly what the National Party did in 1985 during Apartheid. "When the National Party had a state of an emergency, one of the conditions was that the media should not take pictures where there were riots. Some of us have been in that space before. We didn't like it; we hated it." Joe Thloloe said the SABC is in breach of the Code of Conduct of the Broadcasting Complaints Commission of South Africa (BCCSA), that says news must be presented in the correct context and that facts not be distorted in any way. Joe Thloloe warned the SABC that the public broadcaster is running the risk of endangering the lives of SABC journalists with its censorship decision.